Look, I haven’t forgotten the 80% funding myth…. ….but something else has just gotten my attention more and more. Also, I will be doing the 80% funding myth roundup on July 4th, so don’t worry. The whole divestment fad has really taken off, hasn’t it? Canada Pension Plan Investment Board went green with a bang. The pension fund, which boasts the highest credit score at the three largest rating firms, priced $1.5 billion (US$1.15 billion) of green bonds Wednesday in what it called the first green bond sold by a pension fund globally. It was also a record size for a single green bond transaction in Canada, according to Bloomberg data. The 10-year bonds, sold via its unit CPPIB Capital Inc., were sold at a spread of 71 basis points over similar-maturity federal government bonds and offer a 3 percent coupon. They attracted 79 buyers with demand at $2.7 billion, according to a CPPIB statement. The sale was led by CIBC World Markets Inc. and RBC Dominion Securities Inc.
CPPIB’s green-bond framework allows for investments in wind and solar energy, sustainable water and wastewater management, as well as green buildings. It plans to invest more than $3 billion in renewable energy as it prepares for an expected global transition to a lower-carbon economy. CPPIB invests on behalf of the $356.1 billion Canada Pension Plan. It started issuing debt in 2015, selling bonds in both Canadian and U.S. dollars and the euro since. A reminder: Calpers did one of these “green projects”… and lost a bunch of money. The admission came shortly after CalPERS officials voted to divest from high-performing investments in companies that manufacture firearms, fueling criticism that the organization’s investment decisions are based on political factors, rather than a determination to maximize returns. So… lawyers who are scrounging around for their next litigation target, might I recommend going after pension fund trustees who do not understand what fiduciary duty is? Yes, they don’t have deep pockets necessarily (and any money is going to come out of the pension funds ultimately – or the insurers with the D&O coverage (which will then raise premiums on pension fund boards…so it will come out of the pensions), so it may be tough to find a pension participant willing to go along), but there may be slim pickings for suing oil companies and gun companies given where the Supreme Court may be going with respect to these. Efforts by the UK to prevent local authorities divesting their pension funds from companies complicit in Israel’s occupation have prompted accusations of a shrinking space for democratic action from public sector employees and a broad cross-section of rights activists. Last month, the Court of Appeal backed the government in a case brought by the Palestine Solidarity Campaign (PSC) against regulations intended “to stop politically-motivated boycott and divestment campaigns by town halls against UK defence companies and against Israel”. The new rules prohibited the use of “pension policies to pursue boycotts, divestment and sanctions against foreign nations and UK defence industries”, except in cases where the government itself has put in place “formal legal sanctions, embargoes and restrictions”. So here’s the deal. Once you say that divestment is legit — in terms of “We’re divesting from this entire area/industry/company” just based on eeeeeeeevil, then you’re going to have all sorts of groups demanding you recognize their definition of eeeeeeevil. The anti-gas company groups have somewhat changed tactics as they see the anti-gun, anti-Israel, and anti-whatever guys using the “evil” argument, and the anti-gas folks realize that’s shaky ground for institutional fiduciaries. “Don’t invest in evil” is not a fiduciary duty. So the change is to emphasize that the returns for the gas companies should be going down, or something like that. And it does make sense to shift in and out of different industries depending on whether they have certain cycles of growth and retreat. With respect to the gasoline & other fossil fuel industry, there have been booms and busts, and there’s a lot of different parts than just drilling for oil or natural gas. It has to be delivered, processed, etc. It’s not always a vertical system – so there are different parts to it. But if you take that point of view, you do realize that the energy companies are likely going to have some good returns in some years, too, so it can be tough to make the argument to fully divest from a huge part of the economy. A few of the links below I linked to Thursday, but I’m not bothering to cull. Michigan went right-to-work in 2012, and the abusive union tactics that ensued gave us a close-up view of how unions might behave in a post-Janus world. That experience has prompted us and others to anticipate what champions of individual rights must do now. The Michigan Education Association, for example, said it would accept resignations only if they were mailed in, and then changed the mailing address to a new, little-publicized post office box. More significantly, the union said people could resign only in the month of August, locking them in for 11 months of the year. And when some school employees did try to exercise their right to withdraw, the union sent them to collection agencies, saying it was owed payment. In 2013, the Mackinac Center Legal Foundation filed a complaint with the agency that oversees labor relations for the state’s public employees. Nearly two years later, the agency ruled that the August-only rule violated state law. And nearly two and a half years later — five years after right-to-work took effect — the Michigan Supreme Court settled the matter once and for all: Employees are free to leave a union at any time. But they suffered five years of unnecessary uncertainty and fear due to union intransigence. Another Illinois case dealing with mandatory union fees is getting the go-ahead for reconsideration from the U.S. Supreme Court, and it could mean a refund of billions of dollars in fees unconstitutionally forced from government workers. The nation’s highest court Thursday granted a request to take up the Illinois case Riffey v. Rauner, which seeks a refund of $32 million in agency fees from more than 80,000 personal assistants without their permission. The Supreme Court found such fees unconstitutional back in the 2014 case Harris v. Quinn, siding, in part, with Illinois home healthcare worker Pam Harris against an Illinois state law requiring fees to the Service Employees International Union. The nation’s high court vacated the lower court’s decision in Riffey vs. Rauner and kicked the case back to the district court for further consideration “in light of Janus v. State, County, and Municipal Employees,” which found forced fees violated free speech rights of workers that don’t want anything to do with a union. If unions know the money will be clawed back out of them from shenanigans, perhaps they will desist from trying to keep unwilling members… and actually learn how to organize again. Again, one must learn to distinguish between the various players. 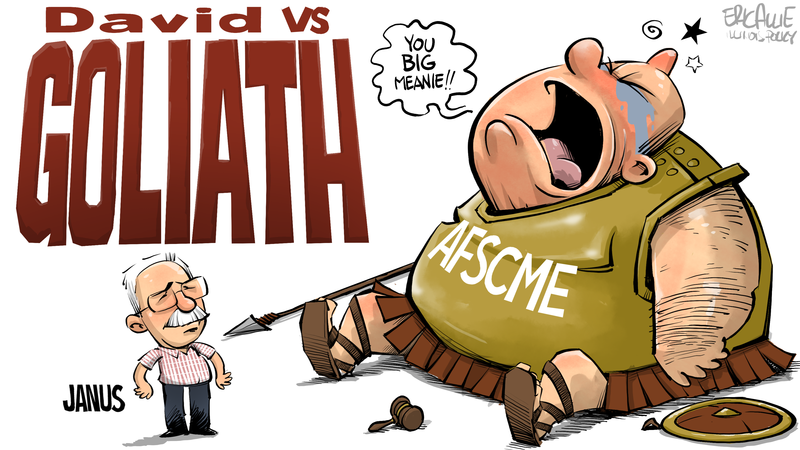 Yes, there’s the union members, but the people really hurt by the Janus ruling are those at the top of the unions as well as the political consultants and political ads paid by union political contributions made to Democratic politicians. Think of all those poor people, having to actually justify their existence. State pension funding is a problem — does Texas have a solution? On those last ones — there’s a gubernatorial race in Connecticut this year — and in Hawaii. It’s interesting how the pension items are popping up in races. Republican gubernatorial candidate and former hedge fund manager David Stemerman says that if elected he would push to eliminate collective bargaining for state employees and open a competitive bidding process for future casino expansion. He said there are two main challenges facing the next governor — saving the state from “a financial crisis that threatens our families and our employers,” and bettering the economy to prevent residents and businesses from fleeing. “The $100 billion of unfunded liabilities is a ticking time bomb that is threatening our state,” he said. Stemerman, a Greenwich resident who closed his $1.6 billion firm Conatus Capital Management to run for governor, said he would try to convince union members that what was promised is unrealistic. The last “collective bargaining” with SEBAC was fairly bad, with the loudest SEBAC voices being totally delusional about how much the state can absorb in additional costs. Heck, it’s not clear that they can cover current costs, much less stepped-up ones. Though seeing how far the Grits have politicized everything else they touch, it’s a wonder they’ve only got this far with the CPPIB: a tribute to the board’s legally-entrenched independence, and the fact that it’s not only a federal but federal-provincial body. I'm fine with non-members going back to square one: seven-day work week with time off for church only. No pensions. No vacation pay. No health insurance. No workplace safety or insurance. Child labor (their children only). No labor unions and every one of those things will erode. PR constitution also says they have to pay their debt and stop paying salaries and pensions in favor of GO debt service payments. But notice how nobody in PR wants to cut spending enough to ensure debt is paid as contracted as required by law and the constitution.